Hayes and Yeading’s first ever visit to Kenilworth Road soon turned into a nightmare as the home side raced into a seven goal lead within the opening 35 minutes. The Hatters announced their intentions within the first minute as Claude Gnakpa crossed from the right to Tom Craddock who was off target from just outside the area. United were soon advancing on the Luton goal, Ram Marwa played the ball down the left flank to Adam Green, his centre found Justin Cochrane on the edge of the box, his drive being deflected wide of the goal by Janos Kovacs. Less than a minute later the home side struck for the first time. A centre from the left saw a plethora of players jump for the ball, a slight touch taking it to the vastly experienced Kevin Gallen who hooked the ball past Clark Masters in the United goal. 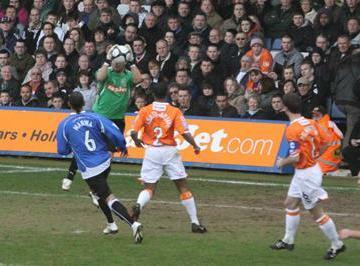 United moved forwards in search of a quick equaliser, Tom Cadmore fired a free-kick across the park to Danny Allen-Page who controlled the ball with his first touch and tried his luck with his weaker left foot, Luton keeper Mark Tyler gathering the effort comfortably. Eleven minutes had passed when a Keith Keane free-kick was headed wide by a well placed Gnakpa, the wide man was not to be denied though as just seconds later Gallen knocked the ball into his path and he drove the ball across Masters and into the far corner. This seemed to be the catalyst that opened the floodgates. Two minutes later Jake Howells deep cross from the left appeared to be left by Ed Harris and Gnakpa arrived behind him to power a header past Masters. United saw a glimpse of goal on 20 minutes when Green crossed deep, Marwa threw himself full stretch at the ball but could not guide his header into the net. Minutes later Craddock ran at the unprotected Harris, beating the defender for pace before squaring the ball to Gallen who struck the ball in his stride past Masters. Three minutes later Keane added his name to the score sheet when he advanced having cut out a Cadmore pass and fired across Masters into the top corner of the United net. Number six came around the half hour mark when Gnakpa beat Harris on the right before crossing deep to Craddock who placed a perfect header across Masters and into the far corner of the net. Minutes later United had another look at the Hatters goal when Scott Fitzgerald charged down a clearance and the ball ran to new signing Charlie Ide who could only manage to fire straight at Tyler in the Luton goal. Ten minutes before the break and the United defence was again shredded. Howells broke free and rolled the ball to the in-coming Simon Heslop, his shot his both uprights before being forced home by Howells. Two new faces and a change of formation finally came at the break and United created an opening within minutes of the restart. Cadmore punted the ball upfield to Ide, his touch found Fitzgerald but Tyler was equal to his effort. Number eight was not far away sadly. Marc Canham’s stray pass in the middle of the park was picked off by Craddock who raced in on goal, his initial effort came back off the upright but he found time to collect the ball and virtually walk it into the United net. With double figures looking a real possibility at this stage it was a relief when the home side changed their forward line. The new arrivals were soon into the action as Matthew Barnes-Homer picked out Liam Hatch in the centre but he blasted over from six yards out. United were to create a couple of chances for a consolation in the dying minutes. Daniel Wishart and Esmond James combined and the latter’s cross beat Tyler but Marwa headed horizontally across the six yard box and then a Green free-kick fell invitingly to Cadmore but he was denied by a last ditch interception from Shane Blackett. United Man of the Match: James Mulley.